All roads lead to Istanbul as the Anatolian saying goes, and so it is that I find myself in the land of Turks. Ive come here to walk the path of enlightenment and roam like the itinerant whirling dervishes once more common in this land. Behold Turkey. Turks are a friendly lot, less concerned with the finite confines of personal space than comradely with their fellow man. Robust fits of laughter erupt from the tea gardens where old men imbibe hot apple tea, chain smoke, and engage in boisterous matches of backgammon. The jovial Turk strolls down cobblestone sidewalks fraternizing with his fellow man arm on shoulder, the proximity of which would seem foreign and a bit awkward to the Westerner. By and large they go about their daily routine with a smile on their face and a glimmer in their eye, this despite runaway inflation and a flailing economy. The US greenback commands a healthy 1,6000,000 Turkish lira. The mandatory 18 months of military service is less than eagerly anticipated by young Turks. The specter of Greece looms on the immediate horizon however, and the two nations speak heated rhetoric and still are at odds over regions such as Cyprus. Turkey is enveloped in rich history, the eons have brought a series of rulers, conquerors and empires. Witness Constantine and the Romans , later the Byzantines, Alexander the Great, the Gauls, Ghengus Khahn, the Crusaders, the Ottamans, and the Turkish Republic to name a few. The mighty Ottoman empire once stretched from Eastern Europe to the Arabian Penisula with Istanbul being the capital. World War One brought strife and devastation, the Ottomans hedged their bets and aligned with the Weimar Republic. The 500 year history of the Ottoman Empire came crashing down and the imperial victors of WWI eagerly carved up the once expansive empire. The present day republic was born when Ataturk led his nation in revolution against the imperialists and the republic was born in 1919. Glance to the north and the straight of Bosphorus spills into the black sea, to the south the Sea of Marmora. Look west and Europe ends on a tiny piece of Turkey....head east and Asia and the Middle-East begin. The weary traveler finds himself up at 5 A.M., chalk it up to jetlag. The cobblestone roads at this early hour glow a ghostly blue and meander through sidewalk bazaars and impressive mosques. The streets are desolate save the peripatetic legions of stray dogs. 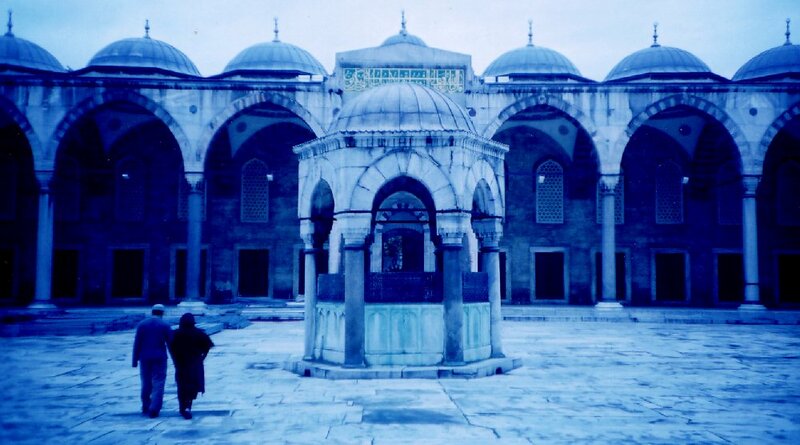 The Ayah Sofia Mosque was once the biggest cathedral in eastern Christianity, later it was converted into a grand mosque. The 6 minarets basque in a sea of floodlights. Birds dart about orbiting the towering poles while the heavy moon lingers above. Nearby stands the looming Blue Mosque. At some point between the time the city lulls into a delicate slumber and the suns ascends the eastern horizon begins the morning call to prayer. Alla ou akbar sings the Imam. The chant begins slowly. First from one mosque, then another then another, then another like dominoes. The individual calls to prayer can only be appreciated transiently, like the first few drops of rain before an inundating deluge. The chants then transfigure into a melodic soup and come to an orchestral crescendo..... the chants can no longer be appreciated piecemeal just as a single drop of rain is no longer audible in a storm. Istanbul wakes up around 8AM and the expansive bazaars bustle with locals purchasing exotic spice and all manner of goods . 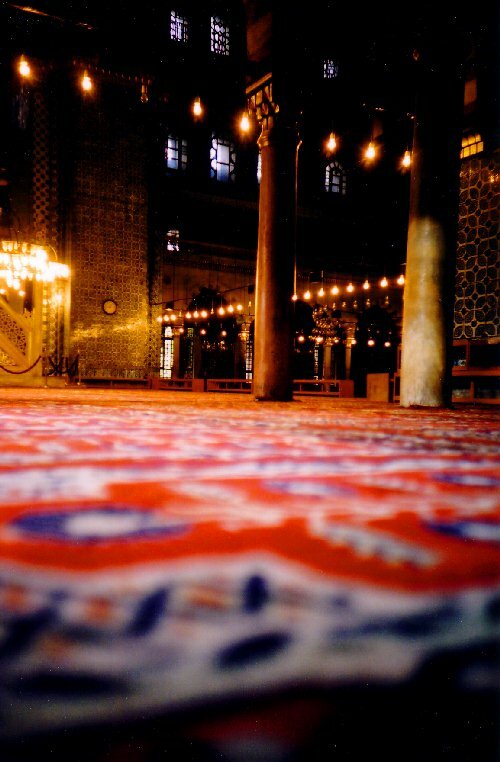 The Topkapi Place was long home to Ottaman sultans and legendary harems are an impressive stop. Equally majestic is the gleaming Dolmubache Palace sitting on the edge of the Bosphorus. Halfway between Istanbul and the Syrian and Iraqi border one comes to the dreamy region of Cappadochia. Truly one of the most breathtaking vistas I've come across. This is a land of unimaginable geological anomalies. One truly has the feeling of residing in a different world. Prodigious red canyons surround hidden valleys. In these valley huge mounds of volcanic rock sprout high into the crisp air. The formations are steep and resemble numerous massive ant piles from afar. The dwellings carved into sides of these cone-like edifices once housed thousands of people, in fact many are still inhabited. Many of the structures are 8 or 9 "stories" tall. Subterranean Anatolia is just as fascinating. In an effort to hide from various pillaging marauders and bellicose tribes the ancient people of this region build sprawling underground cities. Many of these have undergone recent excavation. The one I had the opportunity to tour was boroughed 6 levels beneath the earth and consists of a series of narrow corridors, expansive rooms, cellars, and warehouses. Truly amazing. The white blanket covering the montiain is not snow but peculiar deposits of white calcium rock, surreal to say the least. The multiple pools of calcium saturated turquiose water cascade down the slopes like a series of giant steps. Ancient roman ruins and an elabarte amphitheater sit atop the hill. Heading back toward the Aegean coast lies Ephes, where once stood one of the 7 wonders o the ancient world, the Temple of Diana. The extant remnants of pre-Christian roman aqueducts and scattered ruins leaves a lasting impression on the visitor. Further down the coast lies a village called Kas. This quit village sits along a scenic harbor. The clear mediterranian water is inviting. Cafes overlook scenic coves filled with azure sea. A dip on the beach is a little frigid but inviting none the less. Few things in life are as enjoyiable as toking on a gauloise and sipping a pint of ephes lager while peering across a deep blue mediterranian sea.......the sun ebbs and the last golden hints of sunlight radiate off the jagged rocks abutting the sea. The greek island of Kastorellio lies just off the coast of Kas. Well worth the trip by vessel the island charms with its brightly colored waterfront shops. Like Santorini this island has its share of bright white-washed homes. Wish I could stay.......unfotunately residency calls.